You can use the Impact Analysis tool to generate a report that identifies the procedures that access a specific Master File or field within a Master File. This tool helps you analyze the potential impact of modifying or deleting Master Files or fields. The Impact Analysis tool enables you to analyze data, control search criteria, save reports, and interactively open and edit procedures based on search results. Impact Analysis searches Business Views in addition to FOCUS procedures. This enables you to see if changes in the original Master File will impact fields used in the Business View. For more information about Business Views, see Creating Business Views. The Impact Analysis tool is accessible from the Projects, Data Servers, and Managed Reporting areas of Developer Studio and is supported for Windows, UNIX, and z/OS configurations. Note: You can launch Impact Analysis from the interface or from within the tools in the Synonym Editor and Business Views. When Impact Analysis is launched from the Synonym Editor or Business Views, it searches files based on the application path of the reporting server. From the interface, it enables you to select applications or folders to be searched. When you launch Impact Analysis from within the Synonym Editor, it searches files based on the application path of the reporting server. The Master File opens to the Tree View tab in the Synonym Editor. Select the Synonym File name, or a column field, then right-click and select Impact Analysis from the context menu, as shown in the following image. Note: Impact Analysis is also available from the Dimension Builder pane. The Impact Analysis results are displayed in a report spreadsheet. You may use the results toolbar to view server messages, print the report, copy data as text, and export the report. Click Save from the File menu to save the Impact Analysis results. Click Close from the File menu to close the Impact Analysis results window and return to the Synonym Editor. From the Projects or Data Servers area, highlight the Master File folder, select a Master File, and select Impact Analysis from the File menu. Note: You may also select Impact Analysis from the right-click context menu of a Master File. This interface enables you to select applications or folders to search. The Impact Analysis tool opens with the New Report tab displaying the selected (Master) File Name and default Search Paths. Selected Master File. The Master File you selected when opening the tool will be searched by default. Proceed to step 3. Different Master File. Click the ellipsis button (...) to the right of the File Name search field and select a different Master File in the Open dialog box that opens. Single Field Within a Master File. After you select the desired Master File, click the ellipsis button (...) to the right of the Field Name search field and double-click a field name in the Master File context menu. Optionally, to search for procedures in directory paths not listed by default in the Search Paths pane, add more search paths by clicking the folder icon above the Search Paths area and selecting one or more folders in the Browse for Folder dialog box that opens. Note: You can also delete search paths by highlighting a search path and clicking the Delete icon above the Search Paths area. Click Analyze to display a report in the Impact Analysis Result pane. 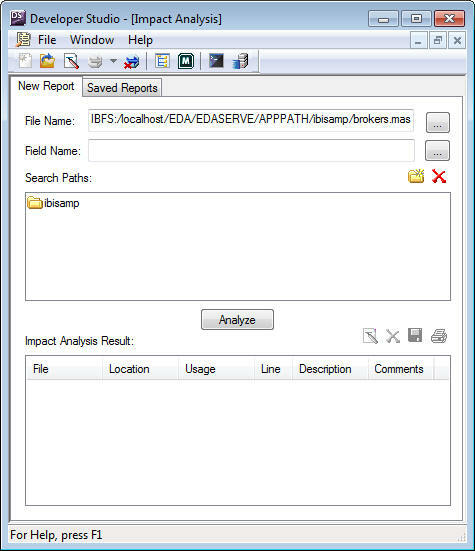 The following image shows the New Report tab of the Impact Analysis dialog box populated with File Name search criteria, multiple Search Paths, and a report displayed in the Impact Analysis Result pane. You have options to edit procedures, print the report, delete an item in the report, and export a report. Click the Saved Reports tab to access all previously created reports. Information is appended to this file as new analysis reports are performed. You have options to view reports, import previously exported reports, and delete reports.